Home » Microwaves, Ovens & Roasters » Toaster Ovens » What is the Best Toaster Oven under $100? If you already have a conventional kitchen oven and just want a smaller and more efficient one to use in summer or when cooking for a party, there’s no need to spend a bomb. A toaster oven takes up less power and does not heat up the home the way a regular one does. It pre-heats faster too. Use it as a second appliance for parties or whenever the job calls for simple toasting, baking, broiling or baking and you may not even notice any difference. The best toaster oven under $100 should be able to do all these things easily even if you don’t get a lot of fancy features and pre-set cooking functions present on more expensive models. The following picks should be enough for you to find the oven for your needs but if not, take a look at more options here. If you find that you’d rather increase your budget to include some of the best rated toaster ovens on the market, we have our top picks here. However, if all you’re looking for is a toaster that can fit any slice of bread, take a look at some good long slot toasters. When the Oster TSSTTVMNDG Toaster Oven describes itself as a large capacity toaster oven, it isn’t kidding. This device can toast six slices of bread to your specifications and its roomy interior can hold a 13 x 9 pan without handles, allowing you to bake everything from chicken, roasts and casseroles without having to turn on your wall oven. This Oster also has a convention feature that circulates hot air throughout the oven for quick and even baking. And speaking of baking time, the 90 minute countdown timer automatically shuts the oven off when time is up. In addition to your being able to set precise temperature and cooking times for the toast, bake and broil functions up to 450°F, it also has preset features for pizza, defrost and warm settings. All these can be set via the digital control panel. Its interior light can be turned on to check on your food while it’s cooking in this oven. Additionally, its two rack positions allow you to place your food in the proper location to ensure a perfect end result. It also features a removable wire rack and a crumb tray that can be removed from the outside, allowing for easy clean-up. You get two rack positions for cooking. The wire rack should only be placed in the top shelf of the dishwasher. The inside of the oven is easy to clean using a mild detergent and damp cloth. This oven is available in both black and polished stainless steel accents, making it a perfect fit for virtually any kitchen décor and the best toaster oven under 100 dollars. If you are looking for a countertop oven that can handle everything from toast to cookies and even bread, the Black & Decker CTO6335S is similar to the Oster above. Like the Oster, a convection oven feature distributes hot air throughout the device when you’re baking, so your goodies bake quickly and evenly. The maximum temperature you can go with this is 450°F. The digital display is extra-large and easy to read and comes equipped with a two-hour timer. This oven is also easy to use and features automatic settings for popular foods like potatoes and pizza, and can easily accommodate a large casserole dish or 12-inch pizza. You can also remove the crumb tray from the outside, making clean-up a snap. It comes with a baking pan and you can use any or all of four rack positions! Users say that the unit gets quite hot when it’s on but at this price, all toaster ovens do because there is very little insulation for the casing. However, the convection heating really does make for quick and even cooking, so it I more energy efficient than a standard oven. While a standard 9” by 13” baking pan will fit if there are no protruding handles, a Pyrex glass dish of the same size will not because its handles are too long. The Waring Pro TCO650 is also expansive, with .6 cubic feet of space and 1500 watts of cooking power and can handle everything from six slices of bread to a 12-inch pizza. Like the Black & Decker and Oster ovens, the Waring allows you to cook everything from cookies to a casserole without having to turn on your big kitchen oven. 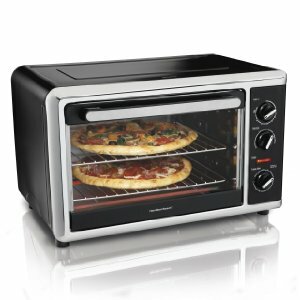 Its front panel display allows you to easily select between the bake, convection bake, broil, toast and pizza functions. This oven also comes equipped with a rack, baking pan to fix on any of the three rack positions, and crumb tray that is easy to empty. You’ll find the touch-pad controls just below a display that gives you a view of both the oven’s temperature while cooking and its 60-minute timer. The temperature settings can only be set in 25° increments and there is no interior light. A few users say that you have to play around with temperature and time settings as cooking may not be as even if you stick to recipe temperature settings. However, this toaster oven can be had for around $80, so it is good bang for your buck. Looking for similar features as the above options but don’t like the buttons or touch pad controls? Look no further than the Oster Convection Oven TSSTTVSKO1 with its easy to use dials. With a temperature range of between 150 and 450 degrees, this oven not only can toast your bread or cook a casserole, it can even dehydrate your food. Homemade beef jerky, anyone? You select from broil, warm, toast, bake and convection bake functions on the dial and then use the other 2 dials for temperature and time. You get two rack positions and this unit is rated at 1300W. This oven also features a 60-minute timer that automatically shuts off and has an easily audible bell so you can hear when your food is done. With interior dimensions of 13 x 13 and a 7-inch height clearance, this oven is roomy and comes equipped with both an enamel baking pan and broiler rack. One safety note: Be aware that when you are using this oven, it does get hot on the outside. Leave plenty of clearance around this oven, and take all necessary precautions so you (and the kids) don’t get burned when you use this model. The Hamilton Beach 31105HB allows you to not only bake and broil your food, but comes with both a convection and revolving rotisserie feature as well. This is another model that has control dials instead of digital controls. It’s a bit smaller than the models above and can accommodate a 11 x 12 cookie sheet. It also comes equipped with two cooking racks and baking pans and a broiler rack. Rotisserie accessories like a skewer, lifter and drip tray are also included with this oven. You’ll also find this oven easy to use. Bake, broil, convection and rotisserie settings can be found on the outside of the device, which can heat up to 450 degrees. And, if you don’t like being tied to your kitchen while you’re cooking, this oven is for you. Both its bake and broil settings have a two hour timer. You don’t get a toast setting with this model but considering its price, that’s hardly a big deal! If you don’t mind substituting one feature for the other, this could be the best toaster oven under $100. With toast, bake & broil settings but no convection baking, you may think that this is not a good buy, but for under $50 you can’t expect more than what the Hamilton Beach 31330 Oven delivers. Three dials let you set cooking function, temperature and timer and the styling is a bit retro. Included accessories are a baking pan, broil rack and slide out crumb tray that is completely removable. You can fit a 10 by 10 inch pan or a medium size pizza. The timer only goes up to 30 minutes, so it’s not meant for serious cooks but it works well for singles at home or for office and dorm room settings. You will need to watch the cooking at first as foods can become overdone very quickly in this, but once you are used to cooking times, it’s a breeze to use.